This article is about the zoo and aquarium in Singapore. For the type of travel, see river cruise. 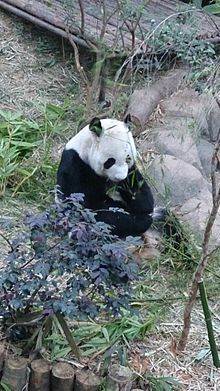 The Giant Panda Forest was opened to the public on 29 November 2012, with a soft opening on 3 April 2013, attracting close to 1,500 visitors. This attraction is the fourth zoo in Singapore, along with the Singapore Zoo, Jurong Bird Park, and Night Safari, all of which are managed by Wildlife Reserves Singapore. The park was officially opened on 28 February 2014, and it was announced that more than 1.1 million have visited the River Safari since its soft opening in April 2013. Conceptualization of such as River Safari began in early 2007, and its construction was officially announced to the public on 11 February 2009 with an estimated completion date of late 2011. The project began with an estimated budget of S$140 million as well as an annual visitor rate of 750,000, however since the original announcement in 2009 the budget has since increased by S$20 million in 2010, due to rising construction costs, to S$160 million and the annual visitor rate has also increased to 820,000. The park is built within the current 89-hectare (220-acre) compound already shared by the Singapore Zoo and Night Safari and occupies 12 hectares (30 acres), making it the smallest of the three parks. The park boasts a tropical rainforest setting along with as river theme with various animal attractions, theme park rides and other major exhibits. The park consists of a total of 10 different ecosystems around the world, including the River Nile, Yangtze River, Mississippi, Amazon as well as the Tundra. It features 5000 animals of 300 species, including numerous that are endangered. Among these are anacondas, electric eels, Mekong freshwater stingrays, West Indian manatees, Mekong giant catfish, giant pandas, gharials, red pandas, golden pheasants, paddlefish, jaguars, squirrel monkeys, giant otters and Chinese alligators that are part of an exchange program with the Asahiyama Zoo in Hokkaidō, Japan. The Amazon Flooded Forest exhibit, which houses the manatees and various South American fish, contains 2,000 m3 (71,000 cu ft) of water and has a viewing panel that measures 22 m × 4 m (72 ft × 13 ft). Its volume and the size of the viewing panel are both world records for a freshwater aquarium. One of the main attractions is a pair of male and female giant pandas – Kai Kai (凯凯) and Jia Jia (嘉嘉) – which are housed in a specially constructed climate-controlled enclosure which change throughout the four seasons emulating their original environment. The zoo grows its own 8,000-square-metre (86,000 sq ft) plantation of special bamboo specially for the feeding of the giant pandas. These pandas are a sign of the twentieth anniversary of friendly Sino-Singapore relations. The park also received a conservation donation from CapitaLand. The names of the two pandas were selected from entries of a public naming competition organised in 2010. The pandas, which arrived in September 2012, are on a ten-year loan from China. The park features a boat ride called the Amazon River Quest. It features over 30 wildlife species from the Amazon River, such as Brazilian Tapirs, Capybaras, Red howler monkeys, Scarlet ibis, Collared peccaries, jaguars, black howler monkeys, Golden-headed lion tamarins, and Giant anteaters. It was opened to visitors on 7 December 2013. A 15-minute Reservoir Cruise on the Upper Seletar Reservoir, will travel along the outskirts of Singapore Zoo and the Night Safari compound, which border on the reservoir, giving visitors a chance to spot animals including giraffes and Asian elephants. Tickets are priced at S$5 for adults and S$3 for children aged three to 12, on top of River Safari admission. Each cruise can take up to 40 passengers and runs at 15-minute intervals from 10.30am to 6.00pm daily. The boats are wheelchair-friendly. The ride opened on 1 August 2014. ^ "WILDLIFE RESERVES SINGAPORE BUILDS RIVER SAFARI" (PDF) (Press release). Wildlife Reserves Singapore. 11 February 2009. Retrieved 2010-10-12. ^ a b c "Park Experience". Wildlife Reserves Singapore. Retrieved 28 November 2013. ^ a b c d Wildlife Reserves Singapore Club (20 March 2013). "About River Safari" (PDF). Wildlife Reserves Singapore Club. Retrieved 27 November 2013. ^ a b Grace Chua (May 21, 2010). "Pandas, polars at new Safari". The Straits Times. Retrieved 20 October 2010. ^ "Kai Kai and Jia Jia to make public debut on Nov 29". The Straits Times. 29 October 2012. Retrieved 7 November 2012. ^ "River Safari opens to public during soft launch". Channel NewsAsia. 3 April 2013. Archived from the original on 5 April 2013. ^ "More than 1.1 million visited River Safari since opening last April". Channel NewsAsia. 28 February 2014. ^ a b c Grace Chua (11 February 2009). "River Safari in 2011". The Straits Times. Archived from the original on 21 October 2010. Retrieved 20 October 2010. ^ a b c d Mustafa Shafawi, Hetty Musfira (21 May 2010). "Attractions of Asia's first river-themed park River Safari unveiled". Channel NewsAsia. Retrieved 20 October 2010. ^ Sharon See (28 April 2010). "Pair of Japanese racoon dogs to be housed in upcoming River Safari". MediaCorp Channel NewsAsia. Retrieved 20 October 2010. ^ Wildlife Reserves Singapore Staff. "River Safari – Official Page". Wildlife Reserves Singapore. Retrieved 8 October 2010. ^ "WILDLIFE RESERVES SINGAPORE TO RECEIVE TWO GIANT PANDAS FROM CHINA" (PDF) (Press release). Wildlife Reserves Singapore. 11 November 2009. Retrieved 2010-10-12. ^ "Amazon River Quest". Wildlife Reserves Singapore Group. Retrieved 7 December 2013. ^ "River Safari launches boat ride, marking completion of wildlife park". Channel NewsAsia. 7 December 2013. Archived from the original on 10 December 2013. ^ "Launching This Friday: New River Safari Cruise". Channel NewsAsia. 30 July 2014. Archived from the original on 2 August 2014. Wikimedia Commons has media related to River Safari, Singapore. This page was last edited on 12 March 2019, at 05:17 (UTC).